Awesome paint grenades from Enola Gaye - Liven up your paintball and airsoft experience. These new Paint Grenades are so easy to use and deploy. 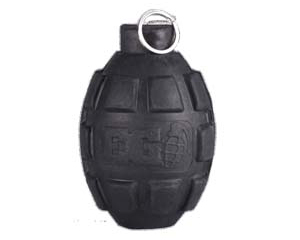 Once you have removed the protective cap simply pull the pin upwards and hurl the grenade in your desired direction. There are many advantages to the new grenade over the old version. + Works in damp conditions, whereas the old match head design suffered when playing in the rain. + No flame or fuse sparks. The new design has been cleverly design to contain fuse heat and sparks. + Easier to use, no fiddly striking action,so you can operate the grenade without putting you paintball gun/marker on the floor. + Brand new grenade body. The new casing is stronger in your hand but blows apart easier from the inside.